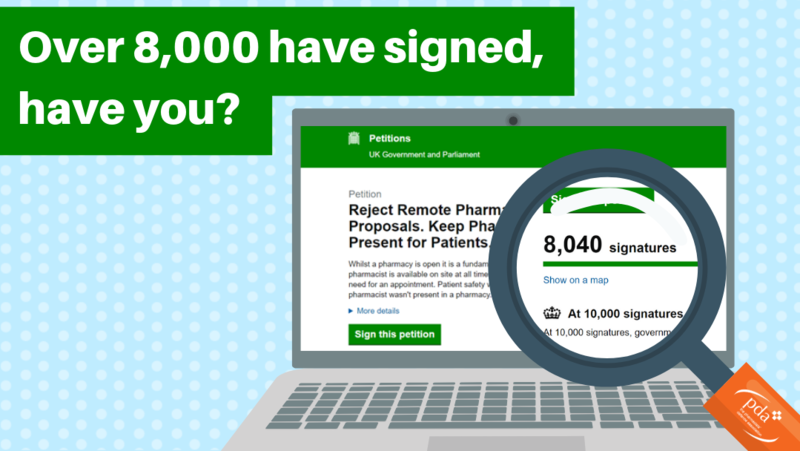 A public petition against government proposals which could see pharmacies operating without the presence of a Responsible Pharmacist has received over 8,000 signatures. The PDA urge you to help increase the current figure, if the petition reaches 10,000 signatures it will receive a response from the government. “Whilst a pharmacy is open it is a fundamental patient right that a qualified pharmacist is available on site at all times to consult in person, without the need for an appointment. Patient safety would be jeopardised if a pharmacist wasn’t present in a pharmacy. The PDA shares the view that patient safety would be jeopardised if a pharmacist wasn’t present in a pharmacy during the medicines dispensing and supply processes. The presence of a pharmacist is fundamental to the care and safety of the public. The PDA also holds the view that if the government’s current proposals go ahead, it will inevitably lead to the dispensing and supply of medicines taking place without the supervision of a pharmacist. If the petition receives 10,000 signatures, the government will respond to it. If the petition receives 100,000 signatures, it will be considered for debate in Parliament. We encourage you to click the below button and sign the petition.